Only one person had the entry “Died” next to her name in the passenger list. 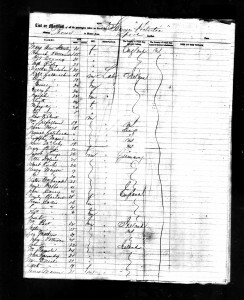 She appears to have been an infant, since she is listed as part of a family, and no age is indicated. This corresponds with Harmen Jan’s description in his letter, where he wrote about many people being seasick, “but only one child in the age of six months died.” A single death was a very good result during the ocean crossing. 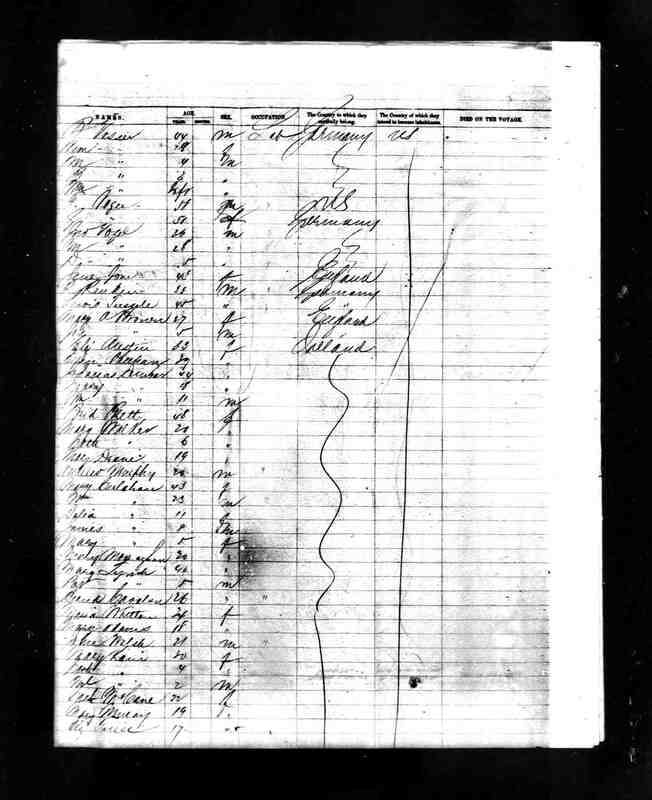 Death at sea was likely a common occurrence (see description of earlier voyages, in Castle Garden article), as evidenced by the column in the passenger list pre-printed with the heading “Died on the voyage”. 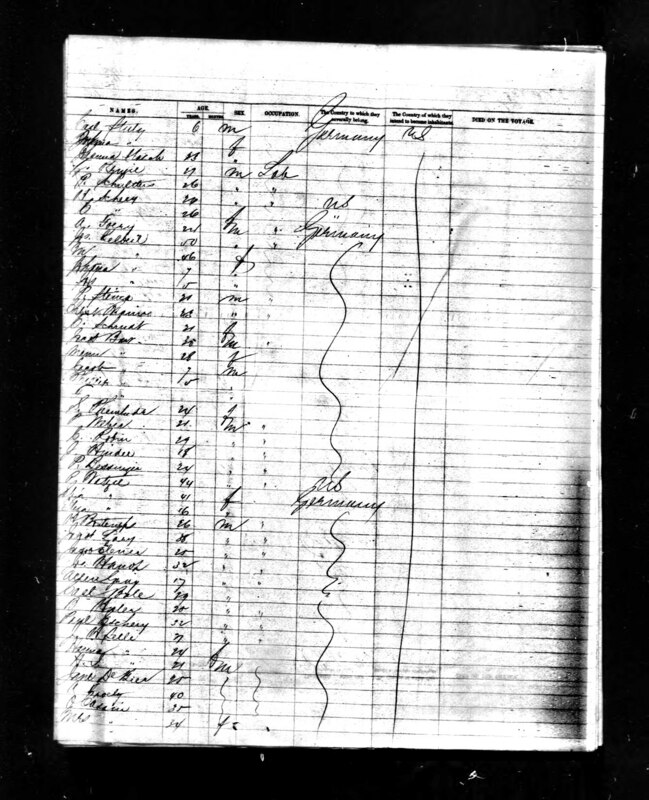 Although the scanned images of the passenger list appear quite complete, the database contains no scanned image of the cover sheet for the voyage, which presumably would have shown the date of departure and the date of arrival. We must rely on Harmen Jan’s letter to give us the October 12 departure date. The arrival date of October 30, 1865, appears in the database listing, although there is no scanned source document that shows that date. Apparently, the person recording the names on the manifest did not feel that the “te” in the name “te Selle” was important. Jan Hendrik (J. H.) and Harmen Jan (H. J.) were listed as “Laborers”. No occupation was listed for Hanna. For all three of them the destination country was listed as “U. S.” and the country of origin was listed as “Germany”. Apparently, the records were not very precise about the country of origin. Winterswijk, Netherlands is only a short distance from the Dutch-German border, but it certainly is an important distinction! Harmen Jan’s letter also mentions traveling with a man from America by the name of “J. 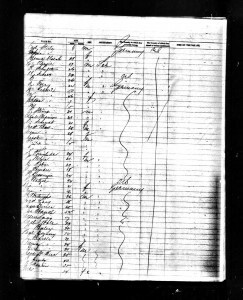 Vogel, who had fetched his family from Holland.” The names of the Vogel family members appear on page 12 of the passenger list.